Glenn Hardy was born in Ventura, California, USA and began piano study at the age of four. He grew up in a musically diverse home where his older brother, an accomplished pianist and clarinetist, was a primary influence. Through access to his extensive record collection, Glenn developed an early interest in a wide range of music including classical, blues, jazz, and big band. Later, rock and folk music were added to the mix, setting the stage for a career in which the cross-cultural and polystylistic musical tendencies of postmodernism would emerge. Receiving a music scholarship to study piano at University of the Pacific Conservatory, Glenn began to investigate medieval and renaissance music, the harpsichord, music of other cultures, and various forms of improvisation. After realizing that he was not destined to become the next Horowitz, and being unable to reconcile his compelling interest in music outside of the classical mainstream with the required course of study, Glenn left the university and the world of piano recitals. He traveled extensively in the United States, Canada, and Europe, including pilgrimages to Salzburg, Bonn, and Vienna, the birthplaces of Mozart, Beethoven, and Schubert. Returning to California, he began performing and conducting early music in the San Francisco bay area. For six years he owned and operated The Harpsichord Workshop of San Francisco, a center devoted to the building and maintenance of early keyboard instruments. During this time Glenn also studied jazz piano, and began composing in a style which reflected his various musical influences. 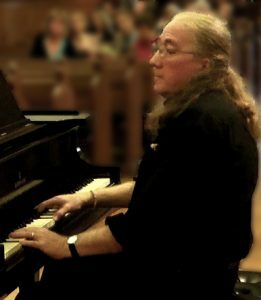 In 1983, Glenn left California for New England where, in addition to composing for piano, organ, chamber groups and orchestra, he collaborates with his wife, Margaret, a poet, on vocal and choral works. Together they have written “The Four Artists” for vocal soloists, piano, and chorus, a look at the relationship between artists and society; “The Age of Exploration” for soprano, cello, and harpsichord, an examination of the roles of women in the renaissance and today; and “Images 1939/1993” for contralto, chorus, piano, and string orchestra, an exploration of modern genocide in Europe. They live in Mystic, Connecticut, USA, where Glenn continues to compose, improvise, teach, and perform. He has many CDs of solo piano music.